Here's an interesting article from Forbes.com on the value of welfare payments. Did you have any idea welfare recipients made so much money? No wonder they don't want to work! How wrong is this??!! Since 2009, the Fair Labor Standards Act has dictated that the federal minimum wage is $7.25 an hour. Some people think that’s too low; others think it’s too high. But it turns out that, in 35 states, it’s a better deal not to work—and instead, to take advantage of federal welfare programs—than to take a minimum-wage job. That’s the takeaway from a new study published by Michael Tanner and Charles Hughes of the Cato Institute. The welfare system, at its best, is a system that gives people a way to live when they can’t find work for themselves, when they’re down on their luck. At its worst, the welfare system rewards people for not working, and incentivizes people to develop habits that make it harder for them to find work in the future, miring them in permanent poverty. In 1984, a predecessor of mine at the Manhattan Institute, Charles Murray, published the definitive book on this subject, Losing Ground: American Social Policy 1950-1980. Murray found that despite the fact that we were spending trillions of dollars on anti-poverty programs, poverty was not improving; indeed, on many measures, it was getting worse. Things had gotten so bad that a Democratic presidential candidate, Bill Clinton, campaigned in 1992 on a platform to “end welfare as we know it, to make welfare a second chance, not a way of life.” In 1996, Clinton signed into law a landmark welfare-reform bill called the Personal Responsibility and Work Opportunity Reconciliation Act, which, among other things, required recipients of cash welfare payments to seek work, or lose their benefits.In 1984, a predecessor of mine at the Manhattan Institute, Charles Murray, published the definitive book on this subject, Losing Ground: American Social Policy 1950-1980. Murray found that despite the fact that we were spending trillions of dollars on anti-poverty programs, poverty was not improving; indeed, on many measures, it was getting worse. But though the 1996 reforms did shrink the cash welfare rolls, other programs have grown substantially in the last 17 years, so much so it appears that the significance of the 1996 reforms may have been overstated. In 1995, Cato published The Work vs. 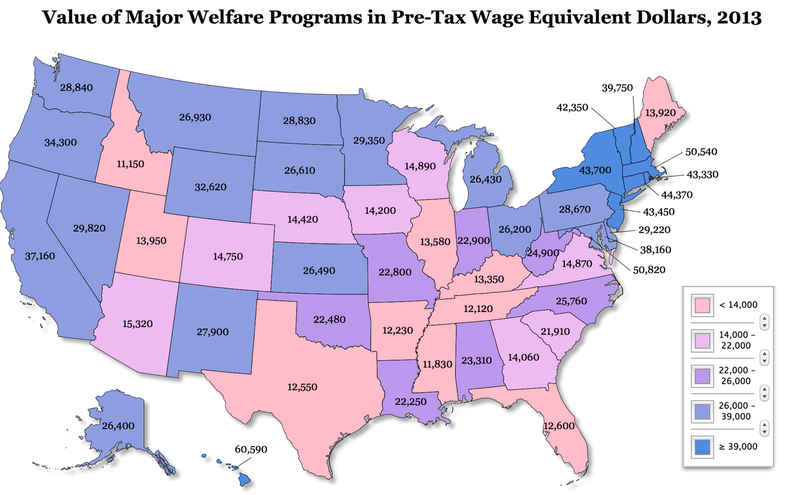 Welfare Trade-Off, which examined the value of welfare benefits in every state. They found that, in 40 states, welfare paid more than $8 an hour; in 17 states, welfare paid more than $10 an hour. Tanner, the principal author of that study, decided to reexamine the numbers in the context of 2013. In Cato’s new 2013 study, welfare paid more than $10 an hour in 33 states; 17 paid less than $8 an hour. Comparing the two data sets and accounting for inflation, 18 states saw a decline in the total value of welfare benefits; 32 states and the District of Columbia saw increases. Tanner and Hughes award the national welfare championship to Hawaii, which offers $60,590 in annual welfare benefits, once you account for the fact that welfare benefits are tax-free to the recipient, compared to work-related wages. That’s the equivalent of $29.13 an hour. Rounding out the top five were D.C. ($50,820 per year and $24.43 an hour), Massachusetts ($50,540 and $24.30), Connecticut ($44,370 and $21.33), and New York ($43,700 and $21.01). States with the lowest welfare benefits were Idaho ($11,150 and $5.36), Mississippi ($11,830 and $5.69), Tennessee ($12.120 and $5.83), Arkansas ($12,230 and $5.88), and Texas ($12,550 and $6.03). The biggest jump in welfare payments between 1995 and 2013 was enjoyed by Vermont, where annual pre-tax-equivalent benefits jumped from $31,580 to $42,350 in 2013 dollars: an increase of $10,770. Other big gainers were D.C. ($6,850), Hawaii ($5,589), New Hampshire ($5,299), and Oregon ($5,288). The biggest decrease was in Alaska, where benefits dropped from $48,655 to $26,400, a difference of $22,255. The other major belt-tighteners were Virginia (-$20,035), Maine (-$18,718), Colorado (-$16,830), and Idaho (-$16,048). Tanner and Hughes count 126 distinct federal means-tested anti-poverty programs in force today. For the purposes of their study, they looked specifically at: (1) Temporary Assistance for Needy Families (TANF), the post-1996 cash welfare program; (2) the Supplemental Nutrition Assistance Program (SNAP), formerly known as food stamps; (3) Medicaid; (4) housing assistance; (5) utilities assistance; (6) the Women, Infants, and Children program (WIC), and (7) the Emergency Food Assistance Program (TEFAP). Not all of these benefits apply to every welfare beneficiary, and some are time-limited, like TANF. But it remains true that an alarming number of welfare beneficiaries do not have an economic incentive to find entry-level work. Also striking about the Tanner and Hughes study is the degree to which this problem would be much worse without the Earned Income Tax Credit, which offers subsidies to working low-income individuals. In effect, the EITC serves as a negative income tax for those with little-to-no income tax liability. It ameliorates the disincentive that welfare recipients have to seek work. A better way to address this problem would be to treat welfare benefits like taxable income. Even low-income workers with no income tax liability have to pay Social Security and Medicare taxes. But welfare benefits are entirely tax-free. You could even increase the scale of welfare benefits, in order to ensure that the taxable net income to welfare beneficiaries remained similar. Such a change would allow for more straightforward comparisons of income from work and income from welfare, and reduce the disincentive for work. Obamacare is doing much to make it harder for Americans to find work, especially full-time work. At the same time, the aging of the Baby Boomers and the growth in welfare payments is making it easier for Americans to give up on looking for work. Absent reform, this won’t end well.